Philip David Charles Collins (born January 30, 1951 in Chiswick, London), is an English singer, songwriter, drummer, and actor. Appearing in Grand Theft Auto: Vice City Stories, Collins is the first real-life celebrity to appear in person in the Grand Theft Auto series, as most celebrities prior have been spoofs of themselves, while others were only mentioned and/or credited in-game for their songs or are only heard as DJs on the radio. Collins can be seen in the third official trailer for GTA Vice City Stories performing his famous single "In The Air Tonight", which incidentally was featured in the pilot of "Miami Vice", a 1980s television show cited as one of the major inspirations and influences on GTA Vice City and GTA Vice City Stories (Collins also made an appearance on the show, portraying a con-man). 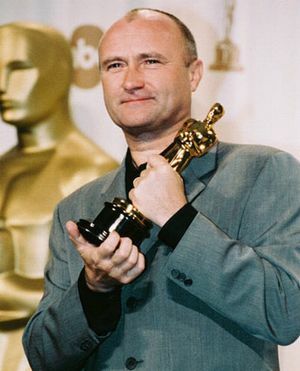 Phil receiving an Oscar for Best Original Song in 2000. Collins was given a toy drum kit for Christmas when he was five. Later, his uncle Mark Wade made him a makeshift one that he used regularly. As Collins grew older these were followed by more complete sets bought by his parents. He practised by playing alongside the television and radio, and never learned to read and write conventional musical notation; instead, he uses a system he devised himself. His professional training began at fourteen when he entered Barbara Speake Stage School. He began a career as a child actor and model, and won his first major role as The Artful Dodger in the London production of Oliver!. He was an extra in The Beatles' A Hard Day's Night - one of hundreds of screaming teenagers during the TV concert sequence and seen fleetingly in a close-up. He was also in Chitty Chitty Bang Bang. He also auditioned for the role of Romeo in Romeo and Juliet (1968). In 1970, the 19-year old Collins played percussion on the George Harrison song "The Art of Dying". Harrison credited him in the liner notes to the remastered CD version of the album released in 2000. Collins was among the last three finalists for the role of "I.Q." on the children's American television show The Bugaloos (he lost out to English actor/musician John McIndoe. Despite the beginnings of an acting career, Collins continued to gravitate towards music. While attending Chiswick Community School he formed a band called The Real Thing and later joined The Freehold. With the latter group, he wrote his first song titled "Lying Crying Dying". Collins' first record deal came as drummer for Flaming Youth who released a single album, Ark 2 (1969). A concept album inspired by the recent media attention surrounding the moon landing, Ark 2 (with Ronnie Caryl, Brian Chatton and Gordon (Flash) Smith), failed to make much commercial success despite positive critical reviews. Melody Maker featured the album as "Pop Album of the Month", describing it as "adult music beautifully played with nice tight harmonies". The album's main single, "From Now On", failed on the radio. After a year of touring, band tensions and the lack of commercial success dissolved the group. 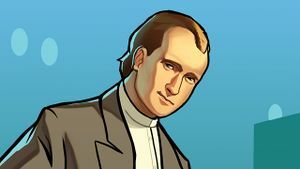 Concept art for Phil Collins from GTA Vice City Stories. 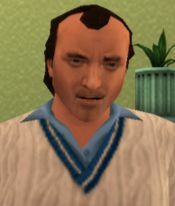 Phil Collins was introduced to Victor Vance in Grand Theft Auto: Vice City Stories by Reni. The three missions, Kill Phil, Kill Phil: Part 2, and In the Air Tonight sees Vic trying to protect him from Forelli Family assassins that try to murder him because Phil's manager, Barry Mickelthwaite refuses to pay back money he owes to Giorgio Forelli. Upon completing "In the Air Tonight", the player can purchase a ticket to see the "Phil Collins: Live in Vice City" concert at the Hyman Memorial Stadium. The ticket costs $6000 and allows the player to see the GTA rendition of Phil Collins sing his hit In the Air Tonight. This page was last modified on 30 October 2014, at 23:53.